On Wednesday afternoon, the Downtown Yonge BIA revealed plans for a new 22-storey mural by artist Adrian Hayles celebrating the musical history of the iconic Toronto strip. 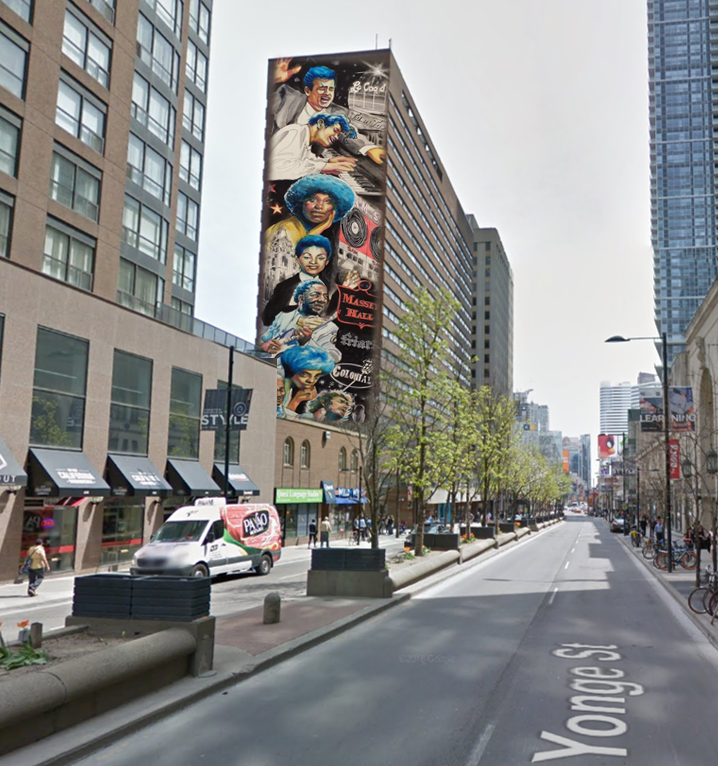 Located on the north side of the Toronto Community Housing building at 423 Yonge Street, the soaring mural will feature prominent figures of Yonge Street’s music scene in the 1950’s and 60’s. Gordon Lightfoot and Ronnie Hawkins, who are featured on the mural, joined Downtown Yonge’s Executive Director & CSO Mark Garner and journalist Nicholas Jennings to introduce the mural. Legendary venues such as Le Coq d’Or and Massey Hall, and the dual neon discs of the famed Sam the Record Man sign, will also be prominently featured alongside the faces of the era’s music luminaries Glenn Gould, Diane Brooks, Jackie Shane, Muddy Waters, Shirley Matthews, B.B. King, and Oscar Peterson. Hayles’ dazzling 70-metre mural is part of the Downtown Yonge BIA’s music strategy, which launched last summer in an attempt to re-establish the area as a ‘Music Mecca.’ The mural also falls in line with the results of the BIA’s Yonge Love consultation, which found a desire for more public art in the area. Earlier this summer, Hayles also revealed a mural at Oakwood Avenue and Eglinton Avenue West along Reggae Lane. The Yonge Street mural will take three months to complete, and is expected to be fully interactive through a smart phone app. A full rendering of the mural can be viewed here.